I posted my first blog post on December 6, 2014. I received an email today, it seems that two years ago today, I purchased my domain name of EatLiveBNspired. I can’t believe it’s been two years. WOW! Well, several months ago I decided to update my website. My goal is to reach and help as many people as possible regain their health by providing tips and tools that can be incorporated into their life. My hope is that you will learn and be able to take something that will help you on your journey to better health. The important thing is to Keep focused and keep going! I recently took a trip to see family and friends. It had been three years since I last saw them. At that time I had only lost 20lb. In the last three years, I lost the majority of my weight, an additional 115 lb. Read about my journey here. Along the way I took some photos. These photo help me to see the progress I made. It helps me to stay on track. 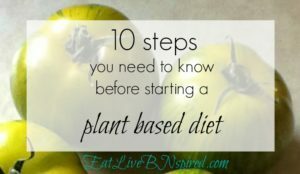 I enjoyed sharing my experience and some of the reasons why I chose to eat a whole food plant based diet. I was excited to share my experience and knowledge I have learned with my family and friends. It was an enjoyable time. 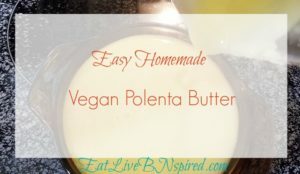 My plant based journey has been one of regaining my health and in the process I lost weight. I am excited about helping others find the freedom I have found through eating a whole food plant based diet. 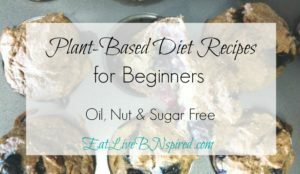 Changing your diet or as I like to refer to it as changing your lifestyle is not always easy. When I first decided to make this change I didn’t really think I would lose a lot of weight and also regain my health. Is it really possible. I am here to tell you, it is! When I first started on this journey, I felt very overwhelmed. There was so much for me to learn. Not only why this was a good way to eat but I had to learn new ways to prepare food. As I continued to improve my health and lose weight I received questions about what I was doing. I wanted a place that I could write down my thoughts and provide information to others. That is what motivated me to create this site. To learn more go to the start here page. 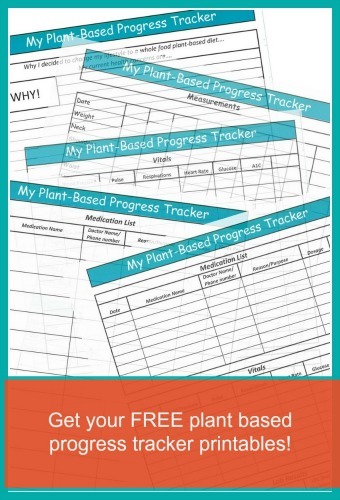 I decided to created a Plant Based Progress Tracker. This printable worksheet was designed with you in mind. Tools to help you along your journey to better health. This will be a place you can write your why, list your starting numbers, medication, vital signs, lab result and more. A place to keep all those numbers so you can follow your progress as time goes on. That way you can focus on your goals. It’s not all about the number on the scale. This Tracker is a place to write down the reason why you decided to make a change. What happened to make you decided or maybe you said, I have had enough and I need to do something about it. I know I said this. You are in control! Even if you don’t feel like you are. This may seen like a minor thing but writing the reason why lets you remember when times are tough or when they seem overwhelming. Remembering the reason why I decided to change helped me to keep going. If we don’t keep going we will not get anywhere. Just take it one day at a time. I know that for me when I start something I just start and don’t think about writing things down. I find myself saying, “Oh, I will remember”. In the end I forget or if I happen to write things down I lose where I put it. My big dream for this site is to help other accomplish their goal of regaining their health. My goal with Eat Live Be Inspired is to help you get started and inspire you to keep going. You are worth it. It doesn’t matter where you are starting from. What you have not accomplished in the past. 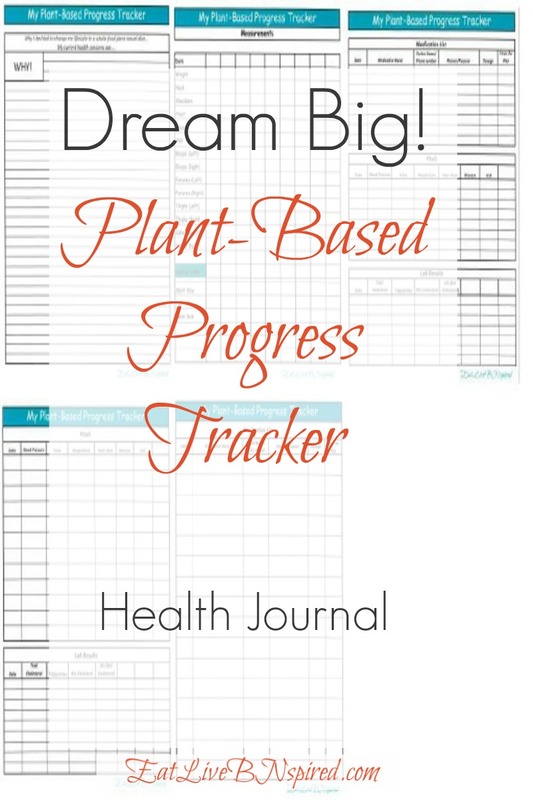 The Plant Based Progress Tracker is the first step to getting started and accomplishing your goal. What is your big dream? I would love to know. Congratulations on not only your weight loss but your blogging journey! Your site looks great. Thank you Debbie! I really appreciate you support on my blogging journey. One thing I have learned is that with the right support anything is possible. 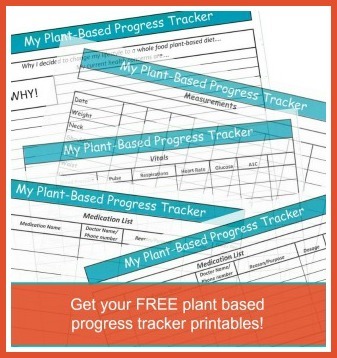 Printing off my tracker now. Thank you for sharing with us. Your welcome! I have more pages I will be adding to the tracker.